Efforts to harness the energy potential of Earth's ocean winds could soon gain an important new tool: global satellite maps from NASA. Scientists have been creating maps using nearly a decade of data from NASA's QuikSCAT satellite that reveal ocean areas where winds could produce wind energy. The new maps have many potential uses including planning the location of offshore wind farms to convert wind energy into electric energy. Wind energy has the potential to provide 10 to 15 percent of future world energy requirements, according to Paul Dimotakis, chief technologist at JPL. If ocean areas with high winds were tapped for wind energy, they could potentially generate 500 to 800 watts of energy per square meter, according to Liu's research. Dimotakis notes that while this is slightly less than solar energy (which generates about one kilowatt of energy per square meter), wind power can be converted to electricity more efficiently than solar energy and at a lower cost per watt of electricity produced. According to Liu, new technology has made floating wind farms in the open ocean possible. A number of wind farms are already in operation worldwide. Ocean wind farms have less environmental impact than onshore wind farms, whose noise tends to disturb sensitive wildlife in their immediate area. Also, winds are generally stronger over the ocean than on land because there is less friction over water to slow the winds down - there are no hills or mountains to block the wind's path. 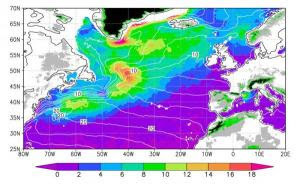 Scientists use the QuikSCAT data to examine how ocean winds affect weather and climate, by driving ocean currents, mixing ocean waters, and affecting the carbon, heat and water interaction between the ocean and the atmosphere. The research, published in early July in Geophysical Research Letters, was funded by NASA's Earth Science Division.